The Burbank Sessions has been a long time coming. The intimacy of live performance heightens the full power of Bruce Sudano’s many gifts. 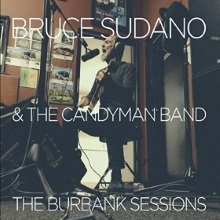 Recorded with the Candyman Band at Lokisound rehearsal studio in Burbank, these seven songs comprise a tuneful illustration of Sudano’s songwriting talent in all its raw beauty. As he notes in the CD sleeve, “If we had an audience I would have called it a live record.” It’s a natural progression from the live-sounding With Angels on a Carousel (2013), his best full-length record to date, and yet it’s also a revelation. He plays and sings with abandon minus any post-production gloss obscuring the sentiment behind each song. Considering the path that Sudano has forged through more than 40 years of music, The Burbank Sessions is even more remarkable. As a singer-songwriter, his work crosses genres and spans several generations of listeners. This is an artist who’s penned chart-topping hits for Dolly Parton (“Starting Over Again”), Jermaine Jackson (“Tell Me I’m Not Dreamin’”), and Donna Summer (“Bad Girls”), while lending his unique singing and songwriting to groups like Alive ‘N Kickin’ and Brooklyn Dreams. Fugitive Kind (1981) marked his solo debut, steeping his songs in the fashionable LA-based pop sensibilities of the era. More than 20 years passed before he released his second album Rainy Day Soul (2003) followed by Life & the Romantic (2009). Each was crafted with an appealing blend of jazz-infused adult contemporary but it wasn’t until With Angels on a Carousel that Sudano immersed his songs in a thrilling combination of rock, roots, soul, and blues. In a way, he came full circle by tailoring his earliest influences into sonic textures that are both modern and classic. The four-piece Candyman Band accompanies Sudano on one of the most enjoyable musical excursions he’s taken, either solo or with a group. Randy Mitchell (lead guitar), Colin Kupka (sax, flute, keys), David Sutton (bass), and Eric Eldenius (drums) provide a strong unit that anchors the set. For the past year, they've been touring with Sudano and debuted many of the songs in concert. The Burbank Sessions was road-tested even before Sudano and the band cut tracks at Lokisound. From the very first note, Sudano grips the listener. A moody, 90-second prelude introduces “One Beautiful Life.” Kupka's sax wails above a slow-churning groove. The rhythm suspends and Sudano sets the scene: "There's a clock on the wall that's a-tickin' / There's a pot on the boil in the kitchen." He builds a sense of anticipation before the music erupts with a contagious backbeat. Sudano's eye for detail and observation informs the lyrics, cresting towards the climax: "Don't give up on your dreams because you're too afraid / 'Cause in the end it's all just gonna fade." It's a bracing introduction to The Burbank Sessions, one that finds Sudano excelling in his craft. The bluesy sway of "These Shoes" delivers a more personal testimony from Sudano as he reconciles the uncertainty of the future with well-intentioned advice from loved ones. "These shoes are right and tight with a fragile sole," he sings. The homonym between "sole" and "soul" accentuates the layered meanings in the song, a candid monologue that shows how Sudano's journey is unknown, despite anyone's assumptions to the contrary. Sudano explores a few different moods over the course of The Burbank Sessions, with "Why Aren't You Here" sounding like the most fun he's ever had on a solo record. There's an effervescence to the track that's sparked by Eric Eldenius and doesn't subside for nearly five minutes. The longing for a lover's touch is palpable, from the background harmonies to Kupka's animated sax solo. Sudano lets his his heart speak on the introspective and sparsely orchestrated "September In Your Eyes." It's a clear window to his feelings, where newfound love dissolves a kind of emotional numbness. The imagery is evocative, especially on lines like, "One of those fish out in the ocean swimming in the sea / So many of them broken, trying to get a hook in me." The range of styles continues to unfold on the set's last three songs. A fresh island breeze wafts through the reggae-tinged "Never Too Late." The infectious hook is an anthem for anyone who's determined to bring a dream to fruition, no matter what the naysayers believe. Mithcell's guitar and Kupka's flute give "Gentle Girl" a hint of noir while Sudano examines "quiet desperation" in "Alone." The latter tune concludes The Burbank Sessions on a pensive yet hopeful note as Sudano cries "Don't give up on love" from the depths of a dark musical landscape. The Burbank Sessions captures Bruce Sudano at an interesting moment in his career. With dates in the U.S. and Europe, his music is finding a home on both sides of the Atlantic and The Burbank Sessions is a timelyforecast of what audiences can expect to hear in concert. It's also a superb document of who Bruce Sudano is in 2015, in fact who he's always been: an artist whose music speaks from the soul and touches the heart.